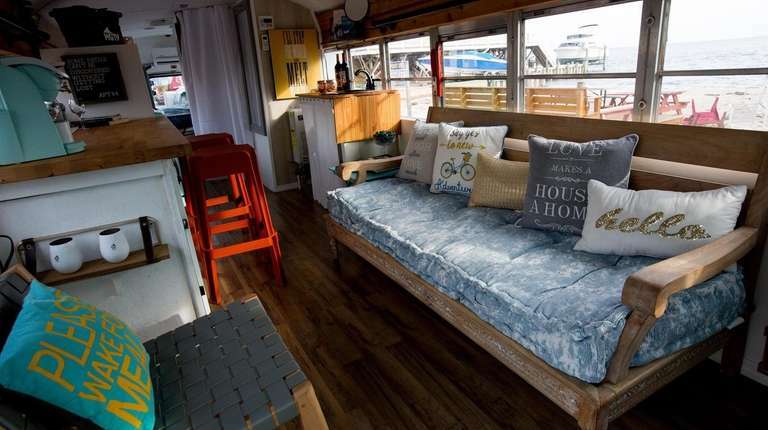 The 225-square-foot mint-blue "skoolie" includes wood floors, heat and air-conditioning, a kitchen, dining area, living room, bathroom with a shower and a rear lounge area complete with a flat-screen TV. 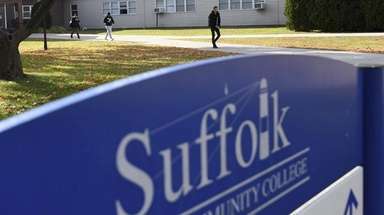 Cat Ovejas has gotten used to the reactions of onlookers when she drives her converted school bus around Long Island. People point. Gawk. She has even seen diners in restaurants stop eating and rush to the window to take pictures. 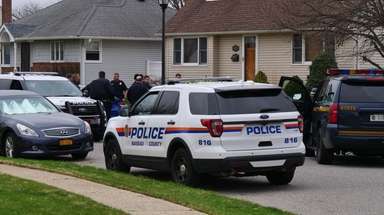 “It catches a lot of people’s eyes,” says Ovejas, a Lindenhurst resident. It is easy to see why boarding the mint-blue “skoolie,” a type of renovated home-on-wheels popular around the country. A peek inside reveals wood floors, heat and air-conditioning, a kitchen, dining area, living room, a bathroom with a shower and a rear lounge area complete with a flat-screen TV. The 225-square foot vehicle comes equipped with a generator, solar panels and a roof deck accessible by a rear ladder. Ovejas, a digital marketing professional and designer, decided to begin working on the vehicle in February as a “passion project” after seeing other skoolies on social media. She bought a 2001 bus in New Jersey spotted on Craigslist, drove it home to Lindenhurst and laid out the interior with a builder friend and collaborator, Jose Rivera, who did most of the labor over the next four months. The tab was around $36,000, which includes $4,000 for the used bus, she says. Raised in Queens, Ovejas christened it “Apt 84” for an urban ambience. The numbers are the ages of her 8-year-old daughter, Taini Votaw, and 4-year-old son, Cree Votaw, both of whom helped with the painting. 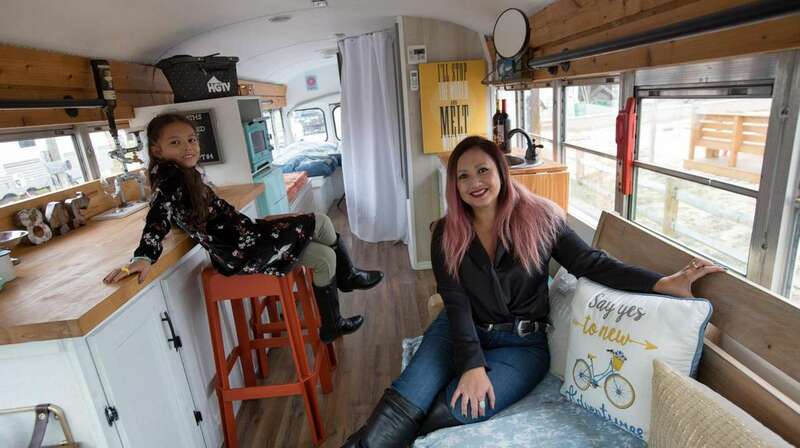 Some skoolie creators build them to live in (most are found in the Midwest or the West Coast), but her idea was to rent it out as a retail pop-up shop or for “glamping” in the wild. So far, it has been used for personal parties, as a backdrop in fashion photo shoots and as a showcase for restaurant tastings by the Foodcaster, a food blogger. The fee is $200 to $300 a day depending on the season. Although she was proud of her work when it was finished, she didn’t expect much after entering it in the Maker Faire last September in Queens, an event sponsored by Make magazine to celebrate arts, crafts, engineering, science and do-it-yourself projects. Not only did it win an “Editor’s Choice” award, it generated a constant line of people during the two-day affair who waited in line for hours to tour it. “They would come on board and say, ‘Wow, is this really a school bus? Can I stay here? Can I buy it?’ They didn’t want to leave. It was exhausting,” says Ovejas. The buzz generated by the magazine honor also resulted in an article about her project in Popular Science and a social media award from HGTV. Now, she would like to start building them for others as a business. Ovejas says she is hoping one day she gets a call from someone who wants her to design a pink “girlie girlie” bus or, perhaps, a black “tactical” bus for an “Armageddon” scenario. “Now that would be fun,” she says. 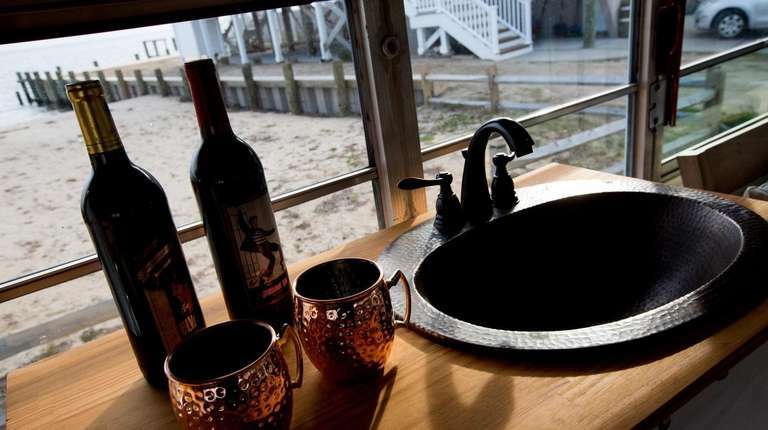 When not in use, she parks the bus in front of her Lindenhurst home with a view of the Great South Bay, which established the “beach apartment” ambiance she had in mind. Initially some friends thought the project was crazy, she says. That’s to be expected with something like this. Bus conversions are not cheap. For example, Cat Ovejas paid $4,000 for the bus itself, $2,000 for solar panels, $500 for a couch, $350 for a mini-fridge and $200 for a copper sink. Things like insulation, flooring, a generator and wood for the deck added thousands of dollars more. And, yes, even nuts, bolts, nails and screws can kick up the cost. The biggest construction challenge, she says, was adapting the top deck and solar panels to the bus’ rounded roof, which was accomplished with bolted-on metal pipes. Heating and cooling is supplied by a ductless “split” unit attached to a rear wall. A 55-gallon refillable water tank for showering and washing dishes along with a generator were installed beneath the bus to save space. She buys bottled water for drinking. The final tab was around $36,000, Ovejas says, but would have been higher if not for the volunteer labor of her handyman friend. Riding around the country in a bus isn’t exactly a new phenomenon. 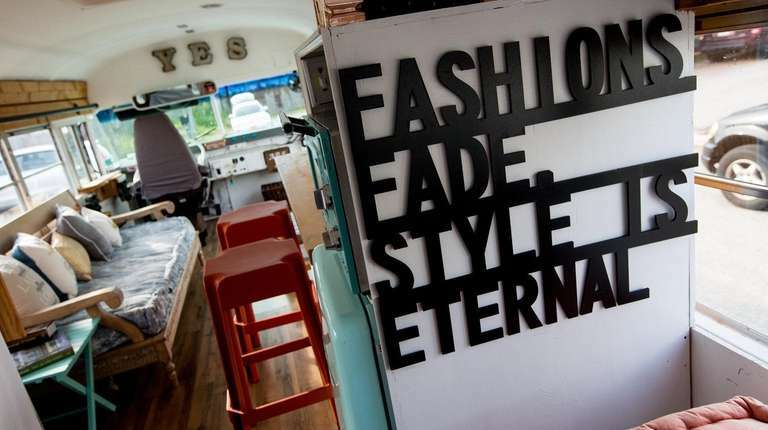 “There’s always been Gypsies and hippies and freaks who used them to travel around,” says Charlie Kern, a free-spirited Denver resident who created his own home-on-wheels, then started a business to build them for other people. Now, his clients are recording artists, Internet entrepreneurs and retirees. The movement began in the late 1940s when bus conversion companies began appearing, Kern says. Now, with social media, there are bus clubs and meet-ups all over the country. Want to join? Below are some questions and answers about the lifestyle before you hit the road. A. Three ways. One, you can buy a used or new bus already converted. Two, you can buy a bus and pay someone to convert it. Or, three, you can do it all yourself. Q. Where do I buy a bus? A. Buses are advertised locally and nationally with sites that offer buy, sell or swap options. Kern recommends looking for auctions held by school districts. Also, check out websites such as publicservice.com and govdeals.com, he says. A. Depends on how old the vehicle is and what you want in it. Kern just completed a $30,000 conversion for a short bus, but outfitted one at a cost of nearly $1 million. Keep in mind an aging vehicle may break down, requiring pricey repairs, he says. A more modern bus might cost between $6,000 to $8,000, he says, but it can run for 200,000 miles. Q. I don’t like all those zeros. How can I keep the cost down? A. Do it yourself. But keep in mind this may require carpentry, electrical work, plumbing and maybe auto mechanics. A common complaint of do-it-yourselfers is that the task can become overwhelming. Q. How safe is this thing? A. School buses have to meet 42 Federal Motor Vehicle Safety Standards and have steel reinforced bodies and bolted mountings. Relax, it’s a tank. Q. Do I need a chauffeur’s license for this baby? Q. OK, I’m interested. Make the close. A. A skoolie is self-contained, so if you don’t like where you’re at, start the engine and move along. Consider that you don’t have to pay property taxes. You also might like the fact that people wave at you a lot. Q. All right, give me the bad news. A. Things like food, clothing and accessories might have to be parsed with limited space. Finding a parking space or a place to stay on the road can be a challenge. Kern suggests RV grounds or campsites. Lastly, mileage is a bummer. If your bus uses gas, you might get three to five miles a gallon. With diesel, maybe seven to eight. Q. Hey, can I tour around in one of these with a band and become a rock star?